My old home-brewery setup has done me well over the last few years. 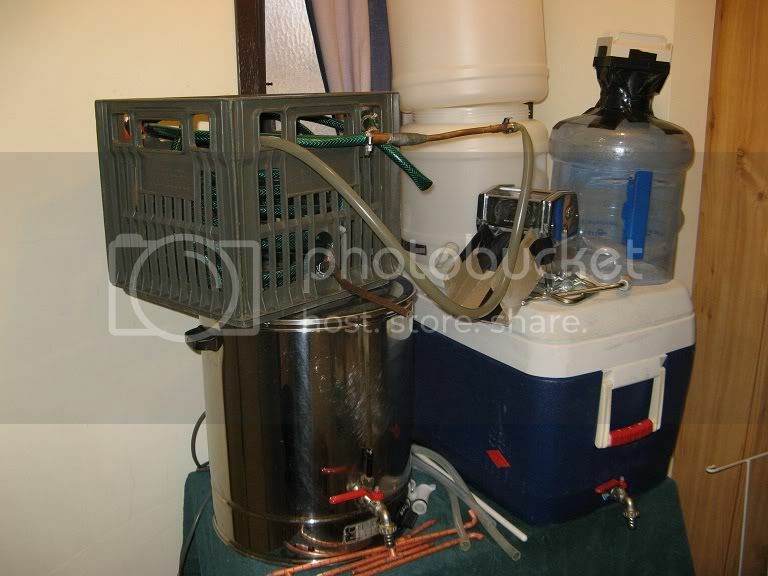 As can be seen in the picture below, the old setup included: 60L esky mash-tun, 30L HLT/Kettle Urn, various copper and brass fittings, DIY CFC and Marga-mill with water-cooler hopper. Appropriate equipment to brew the best and most consistent beer possible (for me at home). Keep upgrade costs to an absolute minimum. Maintenance and cleaning easy and hassle free. Able to brew double batches if required. Minimise or eliminate the need to manually lift hot wort/water. 3-vessel system (more components but easier to design, build, clean and maintain). 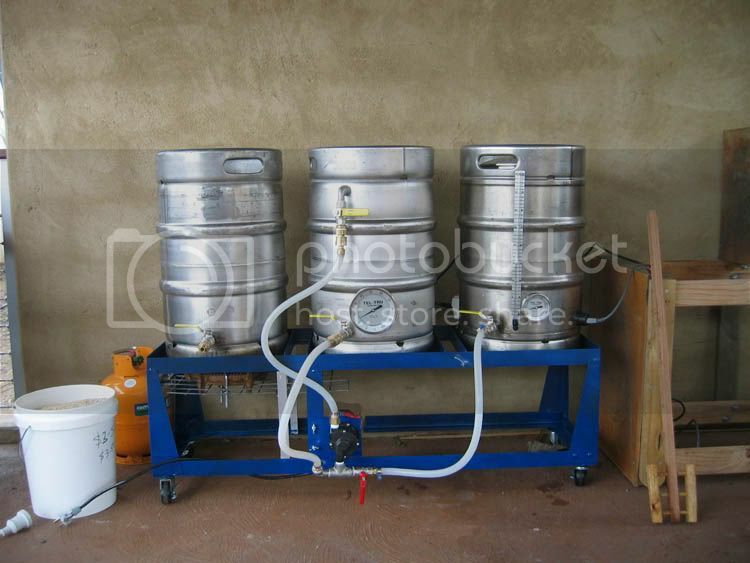 All stainless construction: built from 2nd-hand 50L beer kegs. 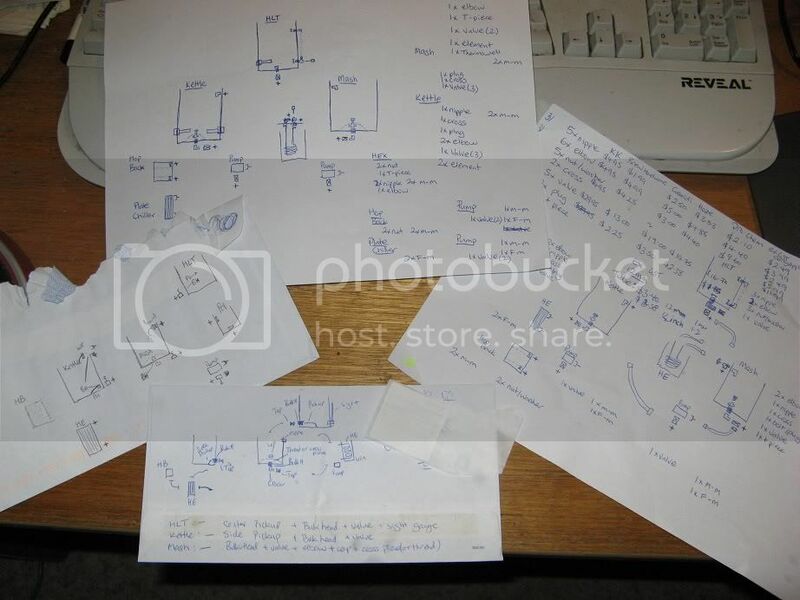 Silicon hose and stainless cam-lock connections. DIY for most everything possible. Careful consideration of each component, source and cost - involving much shopping-around. JD's brewery from HomeBrew Digest forums. 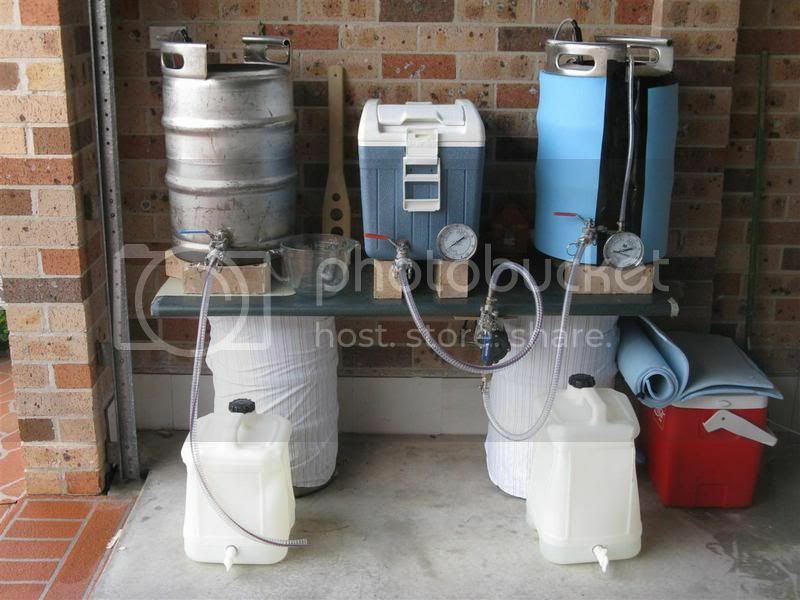 Cortez's Brew Stand from the AHB forums. In addition to the three 2nd-hand beer-kegs, the plan now includes the plate-chiller I picked up cheaply at Keg King, a hop-back that I need to design and build, and a HERMS. With my old setup, I often had trouble both hitting and maintaining the correct mash-temperature, which usually resulted in quick additions of boiling or cold water, over or under shooting mash temperature targets or having to do random on-the-fly decoctions. While the HERMS adds a deal of complexity and additional expense, it should allow mash temperatures to be controlled and stepped in a much more precise and accurate way. No doubt things will change and evolve as the brewery is built, but hopefully all the time, consideration and planning will start to pay off sooner than later - and I'll be able to get back to brewing before the kegs run dry - since I've sold the old system to help pay for the new one! I've followed this brewery on the blog and on AHB - it's looking good! Once you're done with the main build and have brewed a beer in it will you then put the control box on or are you going for the whole thing before brewing? If you're interested, one of my EziBrew ( http://engineerbeer.blogspot.com ) stands might be worth looking at - and seeing as we're both in Melbourne's SE I'll even bring it round myself if you buy one! I think you are only just up the road from me too, so thanks for the offer. 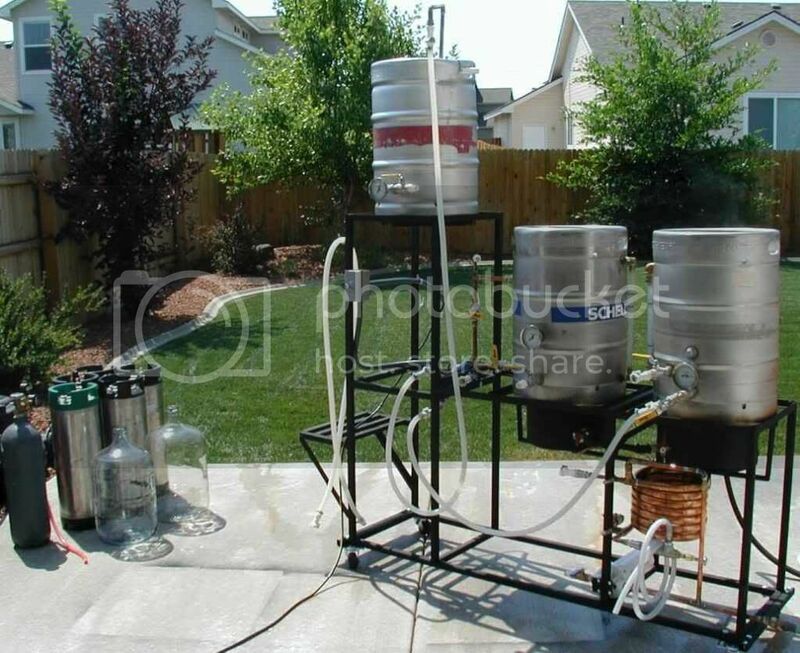 However, a DIY brew stand (more a brew sculpture) is one of the things at the end of my 'to do list'. However, as you suggested it's going to wait until after I've made a few batches of beer on the new setup. Not to mention that I'll need to learn to weld to make one!